Can’t lose weight? Your environment could be to blame. Food prep, bleghh! When just feeding your family, anything, anything at all seems like mission impossible, complicated dishes that take a lot of time to make are just out of the question. Rather than running out and buying unhealthy takeaway for dinner again, embrace your inner lazy person and use these top tips on cutting corners to be healthier. Throw out your peeler Did you know that the skin on fruit and vegetables contain a whole bunch of great nutrients? What a fantastic comeback to say to anyone who pipes up about this lazy tactic. Pumpkin, potato, sweet potato, parsnips, carrots, kiwi fruit, apple, pear, cucumber, eggplant. Wash, chop, cook. Jump on the raw trend You don’t have to be a health nut to reap the benefits of raw food. Salads are one great example and there’s a huge variety of options. Fresh fruit is another. Raw nuts and seeds offer fantastic good fats and are a handy snack. Dried fruit counts- some apricots in a snack pack is a healthy lunchbox idea. Cook for two… Meals that is. 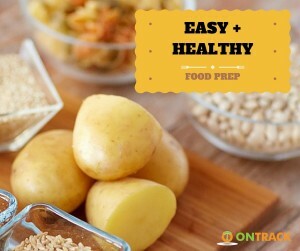 Up your meal size, and you have a healthy dinner plus a healthy lunch for the next day. Just reheat and go. You can also freeze leftovers for another night. Raid the freezer Frozen vegetables usually have the same (or better) nutritional value as vegetables from the supermarket. Grab the packets of pre-chopped mixed vegetables, and throw the whole lot straight in for a healthy stir fry, casserole, or soup. Slow down Before you leave for the day, throw everything in the slow cooker and turn it on. Meat, chicken, or fish with a variety of veggies all mixed together. Tomato based dishes and curries are great choices. Then just come home to a delicious and tender meal ready to be eaten.